How to Pin a file to the Recent Presentations Menu list in Microsoft PowerPoint 2013 ? Here’s a simple tip that lets you to pin a file to the recent presentation menu list in Microsoft PowerPoint 2013 . If you are using a presentation more frequently , there are times when you want to have it pinned to the recent presentations menu list so that it is easier and quick to access it. 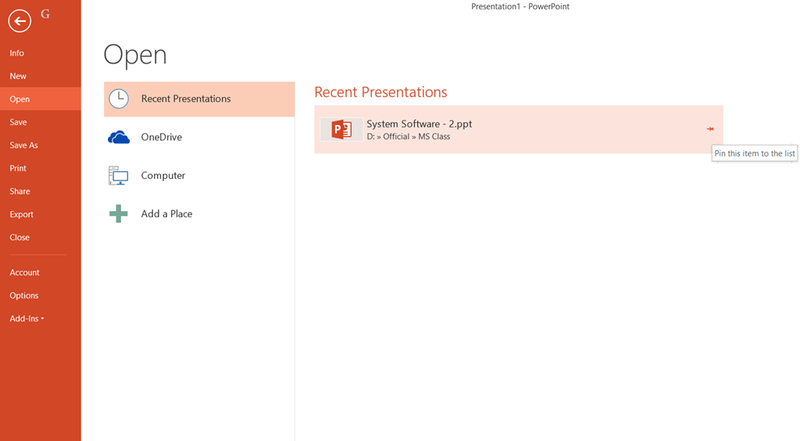 When you click on the Recent Presentations menu , it shows all the files that are recently opened in Microsoft PowerPoint 2013 . To pin a file to the recent presentations so that it never scrolls off , click the pushpin icon which can be found in the right of the file name in the list. This will pin the file to this Recent Presentations Menu.